Susana Canogar is a U.S.-trained landscape architect, at present director-partner of Evergreen Paisajismo in Madrid, Spain. The firm was established in 2015, mostly working on large public projects, where she strives to increase awareness of the profession and the benefits of working with nature through design. In 2001 she founded SC Paisajismo, one of the first landscape architecture firms in Spain. As Director of Landscaping of the large new city district of Valdebebas in Madrid, she has coordinated landscape and urban design from the first planning phases, through to construction and maintenance, promoting green infrastructure and a new approach to public landscaping. 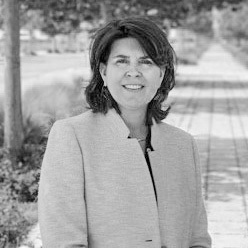 During the years as President of the Spanish Landscape architecture association she worked to increase the visibility of a relatively unknown profession, establish connections with the Spanish administration and actively participated in the European Federation of Landscape Architects, now IFLA-Europe. Ms. Canogar holds a Master of Landscape Architecture from the University of California, Berkeley, U.S.A. Prior to becoming a landscape architect, she was an advisor in environmental policy for the Environment Department of the Ministry of Public Works and Urbanism, where she specialized in International Marine Pollution Conventions, representing Spain in diverse working groups and Conferences.